Happy Mother’s Day! Do you have any special plans with mom today? Brunch, dinner out, or perhaps a family day at home? My mom lives out of state, so if it wasn’t for all the Mother’s day cards gracing the Duane Reade’s I’d fear I would almost forget it nowadays. I can’t remember the last time we were actually together on Mother’s day (no guilt Mom, none at all 🙂 ). However, I love my mom too much to actually forget everything she does for me despite our distance. While I can’t be there to cook her brunch, I can cook it virtually. This year I had no idea what to make her, so I just asked! Mom, I said one day on the phone, what recipe do you want me to create for you for Mother’s day? It took her a few days, but finally she came back to me with seafood quiche. 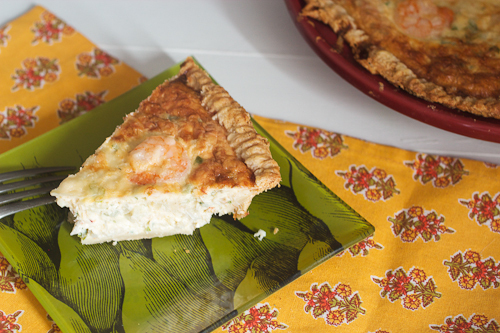 Full of shrimp, crab, and scallops this is the perfect quiche to cook up for your brunch today. I hope you like it mom, I sure did! Now the real question is, will this guy give me a Mother’s Day gift tomorrow? All I want is the chance to sleep in! In a medium mixing bowl, mix together the flour, sugar and salt. Using a pastry blender, two knives or your hands add the butter – 2 tablespoons at a time and blend until the mixture looks like pebbles. Place on a lightly floured piece of plastic wrap, pat into a disk and refrigerate for at least 30 minutes. Dough can be made ahead of time. Once the dough is chilled, roll the dough between two pieces of floured plastic wrap until it is 1/4 inch thick and 10-11 inches in diameter. Remove the top layer of the plastic wrap and transfer it to a 9 inch pie plate. Remove the other layer of plastic wrap and press the dough into the pie plate. With the tines of your fork, prick the dough all over. Pre-heat your oven to 350 degrees F. and once warm par-bake the dough for 15 minutes. Increase the temperature of the oven to 375 degrees F.
In a medium bowl, mix together the quartered shrimp, scallops, crab, shallot, parsley, and gruyere cheese minus 2 tablespoons. In a small bowl, whisk together the half and half, eggs and salt and pepper. Pour it over the seafood mixture and combine well. Carefully pour the seafood custard into the par-baked dough and sprinkle the remaining 2 tablespoons of cheese over the top. Bake for 30 minutes or until the top of the quiche and crust are golden brown. Let set for 5 minutes prior to serving. Quiche will stay fresh in the refrigerator for up to 2 days. Let’s not forget about all the other wonderful recipes #SundaySupper has today to celebrate our Mom. I’m going to have to make this one for my husband! He’s a seafood guy and just the shrimp and crab alone will be enough to have him swooning! Oh, my. I’ve never eaten a seafood quiche, but I want to dive into yours! Scrumptious!!!! 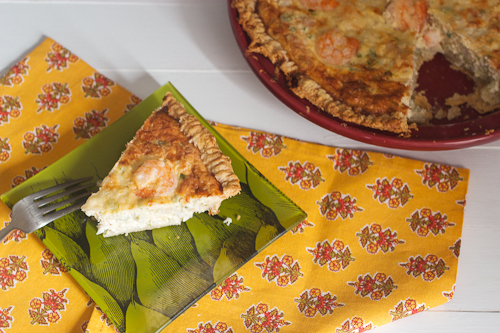 I love the idea of a seafood quiche, and yours looks beautiful! Oh my gosh! This sounds amazing. I hope your mom make it for herself to enjoy now that you have shared the recipe. Ohhh, Seafood quiche sounds amazing! What a great idea!! Pingback: Lemon Risotto with Seared Scallops #SundaySupper | Healthy. Delicious. I love this quiche! Quiche is for me one of the best comfort foods that can also get all dressed up for a party. This is a perfect example of that!! Love!! Look at those big juicy shrimp on top, gorgeous looking recipe!!! Though I don´t like seafood, I´m into every type of quiche. They´re so versatile, and this one does look incredibly good! This looks fantastic. Of all types of quiche, a seafood one will always remain my favorite. This looks and sounds amazing! I have yet to make a crust that doesn’t fall apart…must keep trying…. Susan, you’ve been totally killing it with the amazing brunch recipes this week – I love this seafood packed quiche! And I hear ya on the sleeping in bit. I wake up every morning at 7:00 a.m. on the dot so that I can take my little Abby out of her crate and feed her. 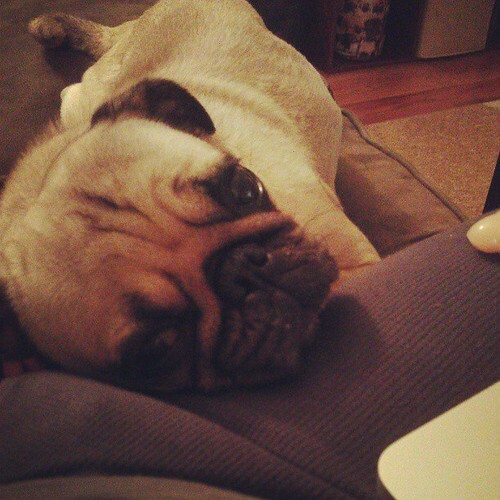 I don’t mind at all though – I never in my wildest dreams thought I would love a dog this much. My favourite time of day is holding her in the morning after she’s eaten and she’s all lazy on my lap. I hope Sir Pugsley let you sleep in a little and that he was a good doggy all day! 7am! We’ve got Sir P. trained to sleep until 7:45. Sometimes he wants to get up earlier, but that does happened. I love our morning snuggles too (and also love that we both do that). He was a good boy yesterday, I slept in while someone else walked him! holy cow this looks amazing! i’ve been on such a seafood kick lately – i’ve gotta try this! 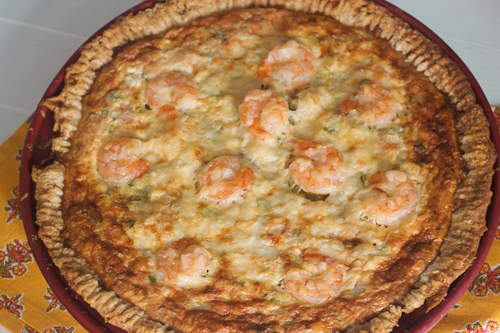 Shrimp, crab and scallops in quiche sound amazing! I had never thought of trying that. Yum! That is one good lookin’ quiche! Love how tall it is. Great recipe for #SundaySupper! Oh wow – now this is a quiche I’ve never seen before! I love that you incorporated seafood…I definitely need to try a slice! I am so glad your mom picked seafood quiche. This is one I could really sink my teeth into and keep it all to myself. So different than the usual quiche. Fabulous!! !